Gamers with deep pockets who appreciate motherboards packed to the gills with features, features, and more features ought to have a look at GIGABYTE’s G1.Sniper 5. Its black and green aesthetics are eye-catching, sure, but its feature-set would surely make its rivals green with envy. Read on to find out what we think of the G1.Sniper 5! In September, I took a look at GIGABYTE’s midrange Z87X-UD3H. With its rich feature-set and $160 price tag, I deemed it an impressive offering – impressive enough to earn itself an Editor’s Choice award. For those wanting an affordable Z87 board and don’t want to give much up, the Z87X-UD3H still comes highly recommended by me. In this article, we’re taking a look at another GIGABYTE board, but one that has a bit of a different focus: The high-end gamer. At $400, the G1.Sniper 5 isn’t targeting the market at large; rather, it’s aimed at those who want a gamer-tuned product with a features list longer than entire 26-volume Warren Commission Report. 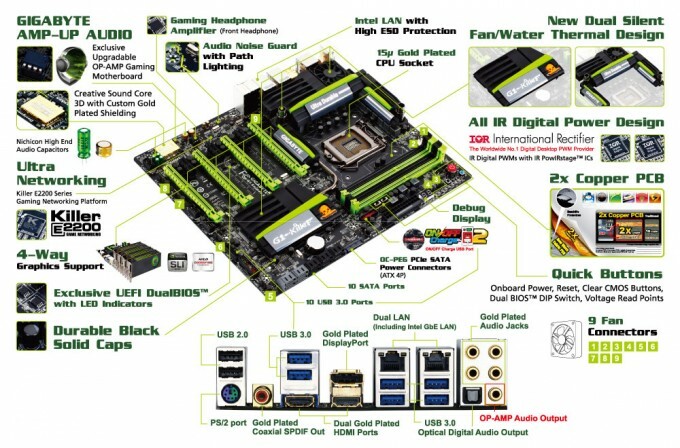 I don’t think it’d be a stretch to dub this board GIGABYTE’s “ultimate” Z87 offering. But, features on paper and features in execution are two different things, so let’s take a quick overview look at the board, and then figure out just what it offers. When a board comes in the EATX form-factor, there’s a great chance that its feature-set is large, and that’s just the case with the G1.Sniper 5. One of the biggest things to set this board apart from most Z87 models is the fact that it supports 4 graphics cards with AMD’s CrossFire or NVIDIA’s SLI. While running mainstream cards in such a configuration might be suitable, I’d quicker recommend the Intel X79 platform for the ultimate in high-end – as mentioned in my look at ASUS’ P9X79-E WS a couple of months ago, it’s not bandwidth that matters so much, but instead electrical lanes. Still, it’s nice to have support for multi-GPU for those who need to make use of it, especially with the rising popularity of Bitcoin mining. With its 4 DIMM slots, the G1.Sniper 5 supports up to 32GB of RAM at DDR3-3000 speeds. For storage, a total of 10 SATA 6Gbps ports are provided; 6 of which are driven from the Intel chipset (which means they are priority for your drives), while the other 4 come courtesy of Marvell. USB-wise, 6x 3.0 and 2x 2.0 can be found at the back I/O panel, while a total of 4x 3.0 and 4x 2.0 can be added via internal connectors. Most people wouldn’t associate “wireless” with “gaming”, but GIGABYTE has provided some rich Wi-Fi and Bluetooth functionality here. On the Wi-Fi side, GIGABYTE allows you to forego the functionality if you don’t want it; and if you do, it can be added in via an included x1 PCIe card. Since its introduction a couple of years ago, GIGABYTE’s G1. series has included a Killer NIC solution on each model, and on the higher-end models, a Creative X-Fi solution. 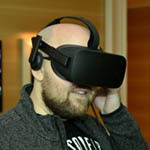 Here, the primary NIC duties are handled by the E2201 chip, and the audio, a cut-down version of a discrete Creative X-Fi solution called Sound Core 3D. I’m not an audio expert, but GIGABYTE touts this as being a far superior solution to a traditional onboard card (such as Realtek, and we’d never disagree). Clearly, the G1.Sniper 5 is a packed board, so let’s get right into our hardware tour, shall we?